Recently I discovered an interesting fact about illuminated (lighted) light switches: they don’t work very well with the new Compact Fluorescent (aka CFL) light bulbs. At first I assumed the light switch must be defective: since the light was flickering, that must mean the switch is allowing current to reach it, even though it’s in the “off” position. At that point I remembered something interesting about illuminated switches that I had forgotten: by design they’re always passing current through, whether they’re on or off. This may seem odd, but it’s logical when you consider that in order for the switch to light up, it needs a circuit to pass through it. The black line with the yellow border represents the “hot” line, which feeds into the light switch. When the switch is “off”, the current stops there, and the black wire leading to the light fixture is not connected to the current. 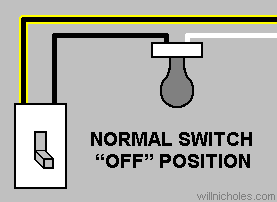 When the light switch is on, then the current continues through the switch to the light fixture (the current is represented by the yellow border), through the light bulb (lighting it) and through the white (“neutral”) wire leading back to the circuit breaker. Without this current passing through, the illuminated switch would not be able to illuminate. Since the current to the light fixture is significantly reduced when the switch is “off,” a normal incandescent bulb will not light. However, there is current passing through the bulb. 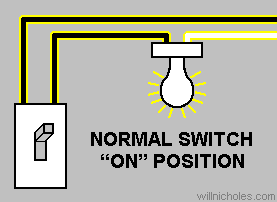 To prove this, you can unscrew the bulb and see whether the illuminated switch stays illuminated. If it’s wired as shown above (and most are), removing the light bulb will cause the switch itself to go dark. 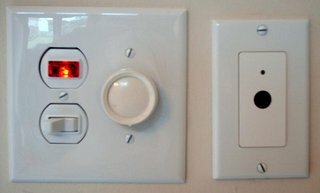 The above illustrations show the wiring for regular “on/off” illuminated switches, but the same principles apply to three-way switches and four-way switches. In fact, if more than one illuminated switch is attached to the light fixture, the problem may be even worse. In most cases, you simply have to choose which is more important to you: the compact fluorescent, or the illuminated switch. In my case, I decided to replace the flickering CFL with a regular (incandescent) bulb. Another option is to keep the CFL(s), but replace the illuminated switch(es) with regular switches. This is the more energy-efficient option, and there are glow-in-the-dark faceplates you can buy which will absorb light during the daytime and release it in the dark. These faceplates work best when lots of light is normally available to them which they can absorb. A third option is to install a switch with a pilot light. 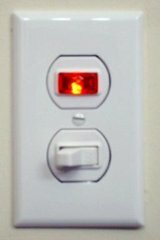 A pilot light works on a different principle from an illuminated switch, and the current to the light fixture is always either entirely on or entirely off. However, this option is only available to you if both the hot (black) and neutral (white) wires are accessible in the switch box. Many light switches only contain the hot wire, so a pilot light switch is not always feasible. Pictured above and below are two pilot light switches I installed in my house in the summer of 2006. If in doubt about what type of switches to install, consult an electrician. 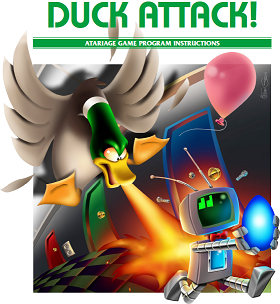 Check out Duck Attack! — the new adventure game for the Atari 2600.